The Catholic Community of Streatham Hill was founded in 1904 when Frances Elizabeth Ellis of Clapham Park gave Bishop Peter Amigo, fourth Bishop of Southwark, funds to build twelve churches in honour of the Twelve Apostles. Miss Ellis and her sister had bought the land from the London, Brighton and South Coast Railway Company. As in all the Ellis foundations, at St Simon + St Jude there is a monthly Mass 'For all who have ever worshipped in this church'. The church, designed by Clement Jackson, was opened in 1905 as the Tulse Hill Mission and Father (later Canon) Rory Fletcher, a former surgeon at Charing Cross Hospital, was appointed as the first Mission Priest. When our church was built, then as now immigrants made a up a sizeable proportion of the population in many inner parts of London. Currently our church has people from 28 different countries speaking 24 different languages. The site of the Church was a cattle pond fed by a stream, which still runs underneath the church. Almost immediately, this stream was the cause of structural weakness, which has continued to give subsidence problems over the years. If you look closely at the walls you can see the cracks but thankfully the church is built on a solid foundation. By 1985 the whole property was suffering from subsidence. An extensive programme of underpinning and repair to the whole structure had to be undertaken as a matter of urgency. At the same time it was decided to modify the church interior. The sanctuary was raised up one metre and a new altar of Ancaster stone backed by an oak dossal and damask hanging was installed. Cheshire sandstone was used for the Tabernacle pillar and the pulpit base. The great Cross and two hand-carved angels, which came originally from Poland, were gilded. 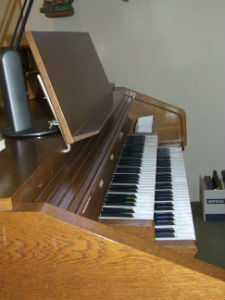 A new Ahlborn electric organ was installed at the side of the sanctuary. A programme to fill the windows with stained glass was undertaken by the artist Andrew Taylor of Devizes in a medieval style. In 2008, the church exterior was repainted and in 2010 the Undercroft was completely refurbished to provide a Parish kitchen and meeting room. Currently we are part-way through a large restoration programme. We've dealt with substantial leaks in the roof, but have yet to tackle the crumbling Confessional and interior of the Church and Sanctuary. Thankfully we are blessed to have a Parish Hall and garden at the back of the church which hosts a number of church and community functions. A lot of work has gone into making the hall and garden a safe place for our Parish, however there is still more cosmetic work to do.